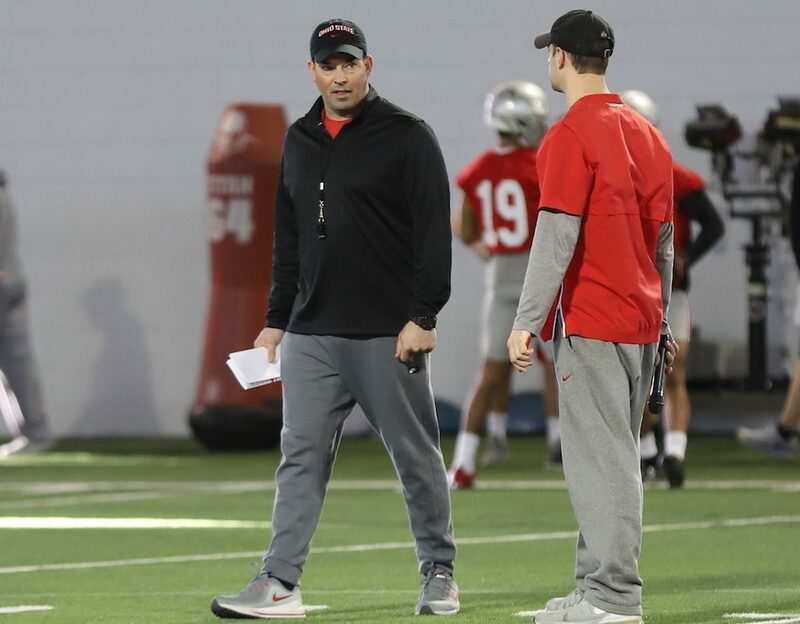 COLUMBUS — Ohio State head coach Ryan Day spoke with reporters following Saturday’s practice. This was also Student Appreciation Day, which saw several hundred students attend practice. Day spoke about the day and also provided plenty of updates on his team, including the quarterback situation. Here are the highlights. + Branden Bowen has been at right tackle this spring, but was moved to left tackle today because Josh Alabi came down with flu-like symptoms. + The thing he feels best about is the energy of the team. + Baron Browning has been dealing with a hamstring since spring break. Tuf Borland took a shot to the knee and was wearing a brace. It’s precautionary on both accounts. + Pretty excited about the quarterbacks. They are taking their reps seriously. It’s the third day in pads and they are still installing play, so sometimes they are running plays for the first time ever. They have had poise out there and they are going up against a good defense every day. + Garrett Wilson has flashed. Dallas Gant has probably had 5-7 knockdowns in the three days with pads. The defensive line is very deep and loaded. + L’Christian Smith voluntarily left the program, but they will keep him on scholarship for the semester and give him whatever support he needs. + Garrett Wilson has great ball skills. He’s very talented. + Robert Landers is still banged up, but he should be okay. + KJ Hill is the H and has come back strong. The best route runner. Austin Mack is going back and forth between X and Z, and Chris Olave and Garrett Wilson are at Z. X is Binjimen Victor and Jaylen Harris. 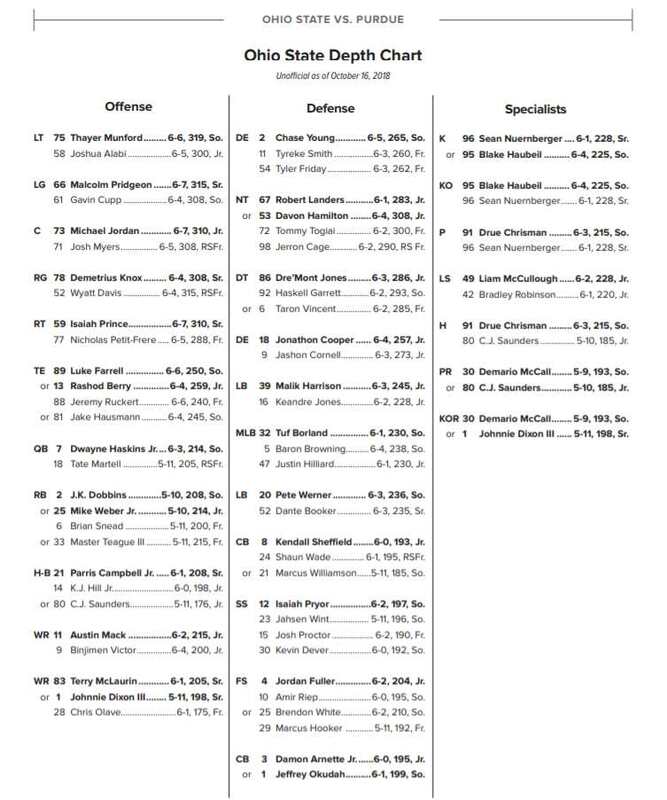 CJ Saunders has been at H. Ellijah Gardiner is at the Z. Garyn Prater is at X. Jaelen Gill is at H. Jeremy Ruckert has been split as an H in two tight end sets. + Austin Mack has versatility and value. Repping him at Z gives him more value and gets the three best receivers on the field. + They want to give Demario McCall a role but he is dealing with a calf injury and hasn’t practiced. + Gavin Cupp has put in a great offseason with Mick. He’s played his dues and works every day. He is getting better. + Justin Fields hasn’t taken all of the reps with the ones. They will split up the reps as best they can. Matthew Baldwin has also taken reps with the ones and will continue to. Today it was Fields with the ones. + Day isn’t interested in getting too much into defensive scheme right now. + Jaelen Gill could have a big role this year. Once the ball is in his hands, he’s really good. He’s crafty and can catch the ball. He’s working through some maturity and has made some good strides. It’s a really good receiver room. + The 2018 class are now freshmen anymore. “They have to play.” If they’re not in the two-deep, then something is wrong. They have to make a push this season if this team is going to do what they want to do. + Recruiting is different now for Ryan Day because the head coach has to recruit everyone. + JK Dobbins has a “white belt mentality” which means he is starting from scratch again so that he can clean up some things. They are working on less jump in his jump cut. + The linebackers are playing fast. Seeing it now from his vantage point, he can see it, but they are only three days in pads, so it’s also hard to tell.